I am wanting to get photos of mating Wood Frogs and have a friend with SCDNR keeping his ear open for me. He reported to me yesterday that they were going at it on his property. Met him this morning and there was no activity, it was down right cold. Counted several large masses from prior days activity. I hung out there till 12:00. I am in SC, upstate. Last Sunday we got good rain with high around 55. Yesterday was clear, 59 (day they were mating) today high was 44, low this morning was 30 with ice on pool. Tomorrow will start at 27, high 50. Thursday cloudy 55/38. So, would Thursday be good to go back? Do I need to wait for next rain? Or, are they done in that spot and I should look for a new spot? Optimum would be rainy night / heavily overcast skies day. Temps down to almost freezing are ok with L. sylvaticus. Where I grew up in the northern Appalachians, the breeding pond could freeze after they started, they would pause, and resume when the skin ice melted. Same here in the southern Appalachians, but I find them more active when the temp trend is warming from freezing to cool. All that said, there isn't a hard fast rule. Thursday sounds like a good bet, day or night. Sunday and Monday currently looks good in your area. Over here in the mountains, we enjoy a longer season because of some breeding sights being at different altitudes. For example, typically at about 1800 feet, mid-February is good, though earlier with a warm January. At 4500+ feet March and April can have activity. In the pics, the indoor temp is air and the outdoor temp is water temp. If you miss that batch you'd be welcome to come over here to increase your window of time for capturing a pic. Hey Bill, thank you much. I am thinking Thursday myself. Overcast conditions will give my better photos too. They are calling for rain Sunday but 41/35 is cold! We checked out a couple of sites where they have yet to start. I am pretty confident that I will get them this year. Where are you located at and have they started there yet? Never mind, I see Unicoi TN. If you're not far from Asheville, I can try to put you on some one evening. Derek, did you do any good? Josh, any movement over on your side? Today I checked two low altitude locations, 1650 feet and approx 2000 feet. Both had frogs. Not a good video - had only the 105mm fixed macro lens, but you get the idea. These same frogs, of course, if approached at night, would let you walk right up to them. In Michigan, it takes consistent warm temps (50f+) for a few days. Usually about a week or so. Never had luck with wood frogs on cloudy days, actually, for breeding. I see them commonly in the summer on cloudy days. Just giving a more northern perspective. Bill - I've seen a few moving this year, but I haven't yet made it out to the actual breeding sites I have. I'm sure they'll be starting soon though - usually any rain till mid-March they'll be out. Here in Northern VA and in Southern MD, I've seen several out during the warm rains but they have yet to start breeding yet. Last year, they started in Late February, around the 23rd. It was a warm spell of several days with highs in the 50s and 60s that kicked it off, not rain. I don't think it even rained until a day or two later. I was out last Sunday and they were out and about - here's my daughter with several dozen egg masses. Is there anything cuter than that? Now that's a herper! Spotted Salamanders are like Wood Frogs in that they are amphib harbingers of spring. 5 days ago, a local forest pond (alt 1700 ft) had no Spotted Salamander eggs. Yesterday there were more than 50 egg clusters. 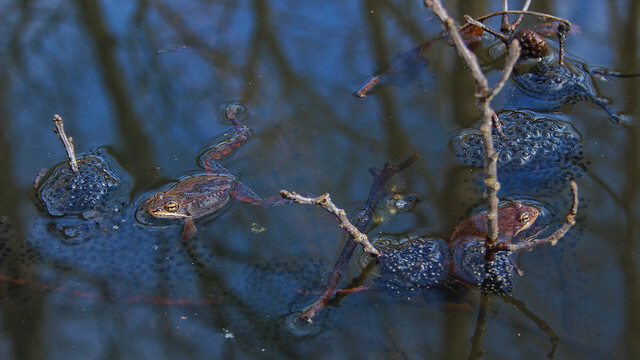 There may be an advantage to wood frogs laying multiple egg masses in the same spot, some, on top of each other. 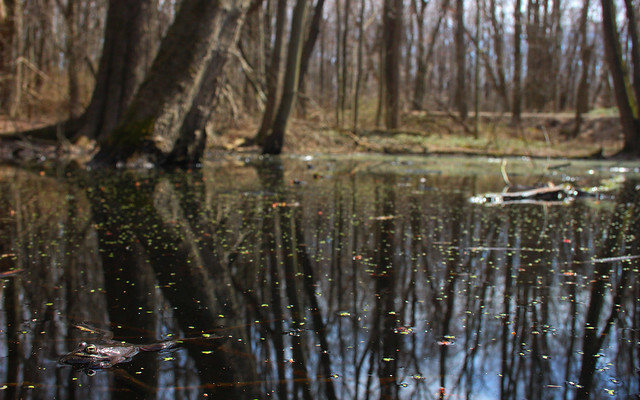 In this forest puddle the fringes of all the Wood Frog egg masses are being gnawed away by newts, so maybe those on top and in the center have a higher probability of survival! Nice! Yeah, it does seem like newts replace fish predators in some of those semi-permanent puddles. Sorry guys! I never did have any luck finding them mating. I did find a pool with a single female. She laid her eggs but they were never fertilized. I guess the males in that area perished. I did find a couple pools that had a lot of activity, I just missed it all. With what I learned this year I am hoping that I can find them next year. I do have a question for the pros. Do the Wood Frogs call and mate during the daylight hours? I know the American Toads will mate during the day but the Spring Peepers tend to only call and mate at night. Bill, did you actually see the newts feeding on those eggs? I found some egg masses about a month back that had a couple of newts present. I am almost positive they were newt eggs and the newts were guarding them. None of the wood frog egg masses that I have watched turned green from algae. The eggs that the newts were guarding in two different locations were both green. I was also told before that the Spotted Salamanders eggs turn green. Please correct me if I am wrong. Do the Wood Frogs call and mate during the daylight hours? I know the American Toads will mate during the day but the Spring Peepers tend to only call and mate at night. Yes, but not as commonly, usually on overcast or rainy days, and they are much spookier. Your approach to the pool must be super stealth. This is an old video, and the only reason you can get so close in daytime is the berm that blocks their view. At night, of course, you can walk right up to them. Peepers often call in the daytime from under cover. Chorus frogs can be 24/7 some places! Bill, did you actually see the newts feeding on those eggs? Yes, and I've put up video of them working on Spotted Salamander eggs as well ( http://www.fieldherpforum.com/forum/vie ... it=spotted ). I found some egg masses about a month back that had a couple of newts present. I am almost positive they were newt eggs and the newts were guarding them. None of the wood frog egg masses that I have watched turned green from algae. The eggs that the newts were guarding in two different locations were both green. I was also told before that the Spotted Salamanders eggs turn green. Please correct me if I am wrong. It's my understanding that the algae growing in the egg masses are a function of sunlight, and can grow in almost any egg mass. There have also been discussions on how this many benefit the amphibian and the algae (e.g. https://www.ncbi.nlm.nih.gov/pmc/articles/PMC3080989/ , http://journals.plos.org/plosone/articl ... ne.0108915 ).